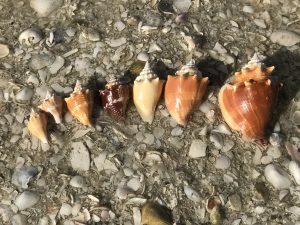 If you’ve done any shelling on Marco Island, you’ve almost certainly seen the fighting conch (strombus pugilus). If you’ve been on the beach after a storm, chances are you’ve seen them scattered about in droves. Despite it’s pugilistic handle, the fighting conch is an herbivore, feeding primarily on algae and males are only mildly territorial. These medium sea snails generally live close to the beach in relatively shallow water. Living snails can often be found washed ashore, so check and see if someone is home before you toss him in your shell bag. The fighting conch has one of those shells that’s both beautiful and commonplace on the beaches around Naples, Marco Island and the Ten Thousand Islands. While this shell, with its picturesque whorls, spines and spire (the pointed tip of the shell) would be considered a real prize on many beaches, we rarely set foot on Cape Romano, Second Chance, or any of our favorite spots without finding several. Above you can see different sizes and colors of the fighting conch shell. The colors typically vary from yellow or cream to orange and brown, often with some pink or purple. As always, older shells are often sun bleached, while a dark red-orange or purple can be an indictor that there is still a living snail inside. Look for the sickle shaped operculum or “foot” in the oblong aperture of a living conch. Thanks for checking out our ISLAND REALTY MARCO shelling blog! 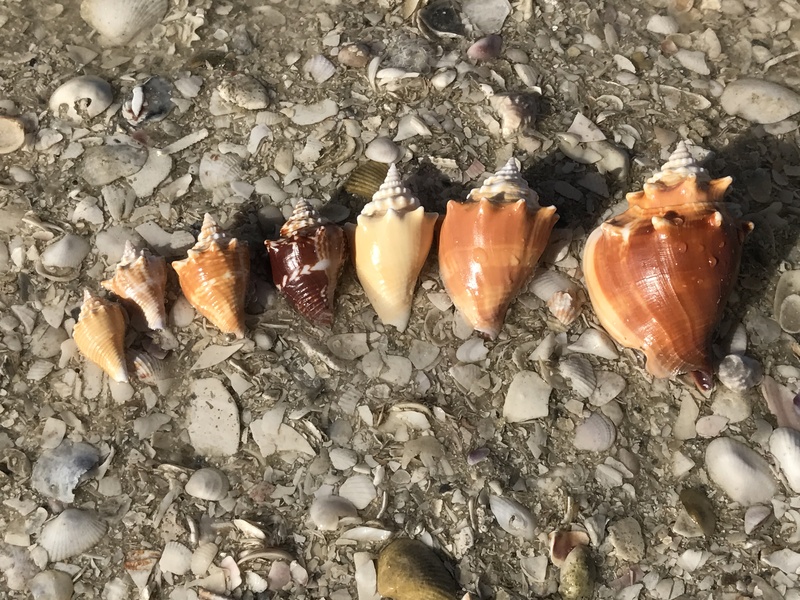 Stay tuned for more shelling info and tips on how to find great shells on Marco Island, or come and take a trip with us so we can show you first hand!